Inspiration can be a real problem. There's just too much of it around. That's a real problem, because most authors find it easier to start a project than finish it. Publishers, bless 'em, cling to the old-fashioned notion that books that have actually been completed and published sell better than all the fireworks that still exist only in the authors' heads. As a disciplined writer, I understand this perfectly and would never allow myself to be distracted by... Wow, did you see that? While doing some highly relevant, important and completely unrelated research on Saturday, I accidentally stumbled on pictures and comments about this gloriously mad motel in Goldfield, Nevada. 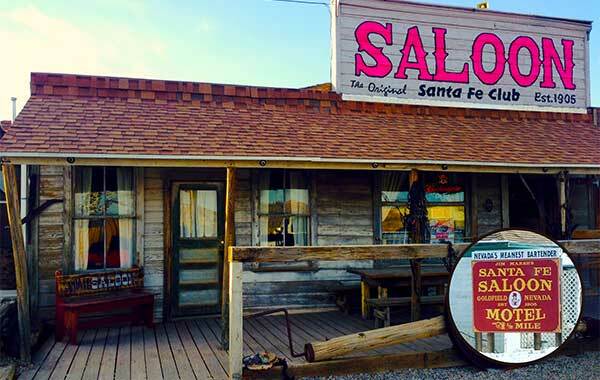 The Santa Fe Saloon promotes "Nevada's meanest bartender" like that was a good thing. I spent a happy half-hour learning that the founder was killed in a gunfight, and that the rooms are pretty decent except that the walls are so thin you can hear the people next door eating their Cheetos. Having reached the end of my allotted writing time, I shut things down and returned to the vital domestic duties of mending the garden and repainting the goldfish, determined to put in a solid 2,000 words tomorrow. Fast forward to 3am. I wake up with an almost complete story buzzing in my head. The saloon is in there, but it's serving as no more than a backdrop. For some inexplicable reason I've floated off into a story of a washed-up lawyer doing questionable work for a sleazy defender. Some of which brings me to here, back on good old US 95, nursing my worn-out Pontiac into a town where it’s the newest automobile for miles around. Goldfield, it’s called, where the homes have wheels even if the cars don’t. I find the motel, unstick myself from the driver’s seat and stand outside doing squats, trying to get the legs working again. The only other car outside the office is Walt Lipmann’s black Wrangler, looking like it’s just been polished. Everything else in sight, even the cat sleeping on the stoop, is desert-dust beige. The motel bills itself as a saloon and there’s a wild-west style hitching rail outside. I check to see if Walt’s tied his Jeep to it. Any chance of finishing off the final piece of War Stories Volume 1 is now doomed. Sunday is sleazy lawyer day. It's a completely new genre for me, one best left to John Grisham, but writing it has been a blast. What's more, I know it's good, which is true a lot less often than I'd like. Now it just needs a title... Wow, did you see that?